Urban Circus has acro balance specialists available for your events. Amazing displays of human interactive balance. 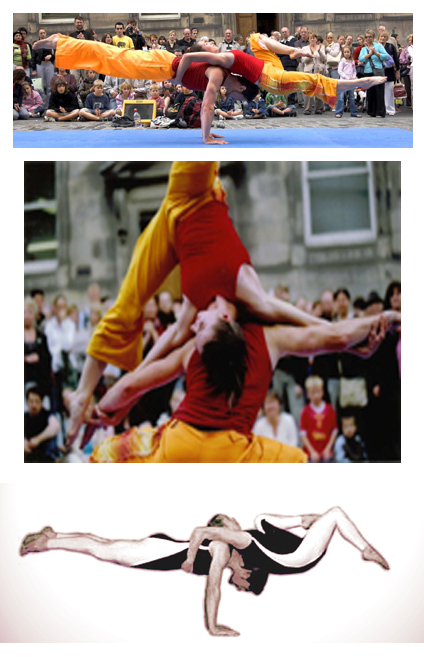 These experienced performers are very popular with festival and staged events such as the Edinburgh Fringe. Suspended Motion perform a jaw dropping street show filled with comic moments, acrobatic stunts and extremely orange trousers (other costumes available!). This show builds towards a high level creative arco-balance performance which will stun and amaze all ages.
" I would like to thank you very much for arranging the acro balance duo for our Children's Gala. They were a huge success. Thanks again for all your help. "